STEM Marin Fund is a non-profit organization that supports the STEM programs of San Marin High School. Previous contributions of STEM Marin Fund have included San Marin's Makers' Space, 32 laptop computers and technology support, classroom and lab supplies, and books and STEM reading materials for students. Contributions to the STEM Marin Fund support the STEM Marin program and are tax-deductible. We are a non-profit 501c3 organization and can provide receipts for tax purposes. Please make checks payable to the "STEM Marin Fund". Thanks to YOU, our second annual “STEM Speaks!” was a success! It was a beautiful evening with great food and wine, fantastic company and conversation, engaging guest speakers, and even a surprise appearance by hip-hop sensation MC Dub. Our preliminary numbers show that “STEM Speaks!” 2015 raised $16,000…which will directly and immediately fund campus habitat and biome teaching gardens and an outdoor classroom passive solar design project as well as technology needs, lab equipment and supplies, workshop tools and materials, and more. STEM Marin Fund is filled with gratitude for winemaker Tom Rees of Pine & Brown Winery, Alon Amit of Origami Logic, and Tony DeRose of Pixar Animation Studios. Special thanks to MC Dub for his famous “Water in the Ocean” rap. Huge thanks to Novato’s Hennessy Funds for generously matching $2,500 in donations. Thank you to Bay Club StoneTree for the delicious meal, impeccable service, and lovely setting. Thank you to to Mr. Williams and Mr. Littlefield for acting as emcees and to the other STEM Marin faculty (and their partners) who shared the evening with us, including Mr. Littlefield, Mr. Williams, and Ms. Vogl. Last, but certainly not least, our wholehearted appreciation to everyone who participated/donated. Please join us at our next STEM Marin Fund board meeting at 7:00 PM on Wednesday, November 4, at the Redwood Starbucks (near Trader Joe’s). We’d love your ideas and enthusiasm! 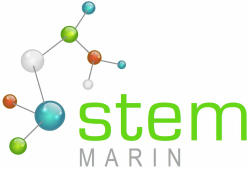 Read all about STEM Marin in this Spring NEWSLETTER. It was a beautiful evening under the stars with great food and wine, fantastic company and conversation, engaging guest speakers, and even a surprise appearance by hip-hop sensation MC Dub! STEM Marin Fund is filled with gratitude for our incredible, passionate speakers: winemakers Alan Baker and Serena Lourie, Jay Tustin of DeepFlight, and Dr. Julian Aroesty, Associate Clinical Professor at Harvard Medical School. Special thanks to MC Dub for his famous “Physics Force Problems” rap. Thank you to Kate Mansergh and Cartograph Winery for providing outstanding wines. Thank you to Rickey’s Restaurant at Inn Marin for the delicious meal, impeccable service, and lovely garden setting. Thank you to to Mr. Williams for acting as emcee and to the other STEM Marin faculty (and their partners) who shared the evening with us, including Mr. Littlefield, Ms. Norinsky, Dr. Lafevre-Bernt, and Ms. Havel. “STEM Speaks!” raised $12,000…these much-needed dollars will help us fund a Chromebook cart dedicated to STEM Marin science classes, technology needs, lab equipment and supplies, workshop tools and materials, class sets of non-fiction science books to supplement textbooks, and whatever else our illustrious teachers can dream up to educate, motivate, and inspire our students. Please join us at our next STEM Marin Fund board meeting at the Redwood Starbucks (near Trader Joe’s). We meet at 7:00 PM on the first Monday of every month, and we’d love your ideas and enthusiasm!